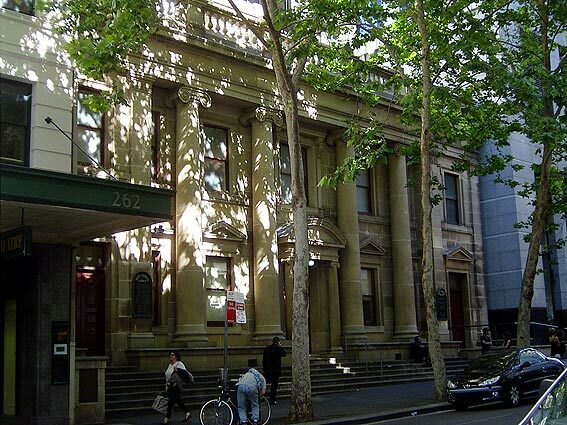 The mother church of Congregationalism in Australia, the foundation stone of the Pitt Street church was laid in 1842 and the building opened for worship in 1846. It was designed by English-trained John Bibb (1810-1862) who in 1832 joined John Verge, one of the leading architects in Sydney, as an assistant. It was enlarged between 1857 and 1867, but the architect of this work is unknown. This included the internal galleries, resting on fluted iron columns cast by Dawson of Sydney, and the vestry to the rear. The present instrument, built in 1910 by Hill & Son, London, as job no. 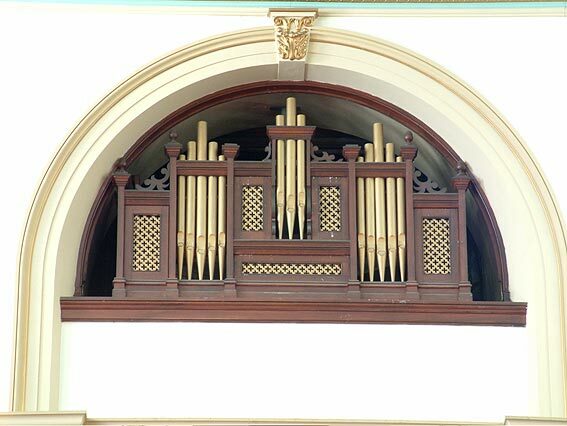 2396, is one of the firms best-preserved later instruments and one of the few larger organs from the first two decades of the 20th century to survive in Australia with tubular-pneumatic action intact. 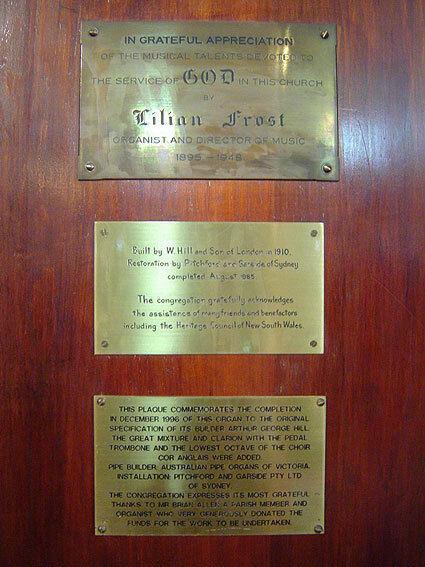 For over 50 years, Pitt Street’s famed organist, Miss Lilian Frost, delighted capacity audiences with her lunch-time recitals, which by 1945, had numbered over 1,000. Well-known for her preference for original works, including a substantial French repertoire, Lilian Frost was apparently well satisfied with the tonal and mechanical resources of the organ, the only addition being the Vox Humana and tremulant, almost certainly provided by Charles Richardson c. 1920. 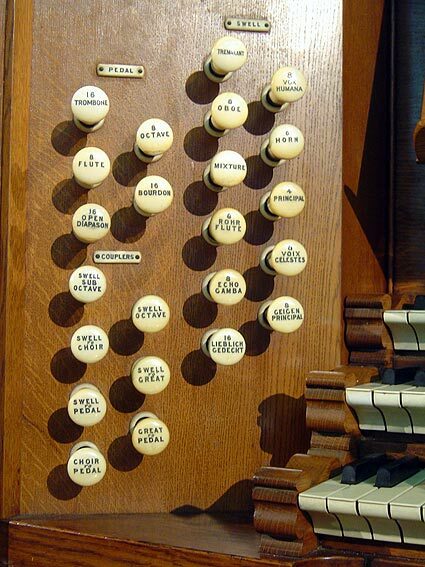 Later alterations included the provision of a concave/radiating pedalboard, the fitting of balanced swell pedals and the enclosure of the choir division. 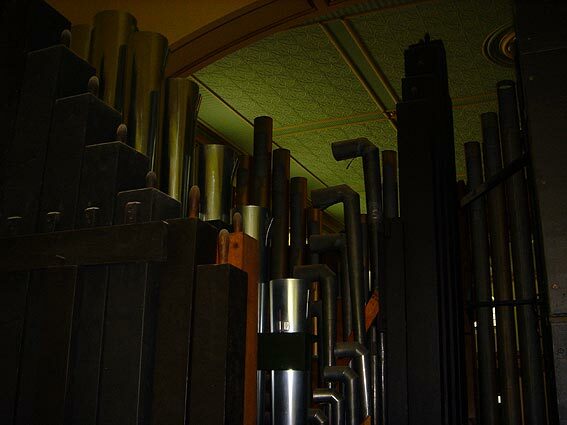 During the 1960s the organ and church were allowed to fall into disrepair, but the loss of the building altogether was prevented by a ban imposed by the Builders’ Labourers’ Federation in 1973. 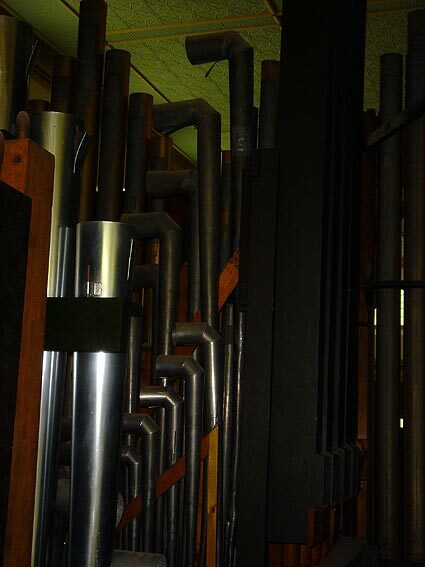 Some basic work to bring the organ back into use was carried out in 1974 by Pitchford & Garside: in 1982 the firm commenced a staged restoration project with Kelvin Hastie as consultant and this was assisted by a NSW Heritage Grant. The prepared-for stops were added by the firm between 1987 and 1996 based upon Hill models, a generous donation by a member of the congregation enabling this to occur. 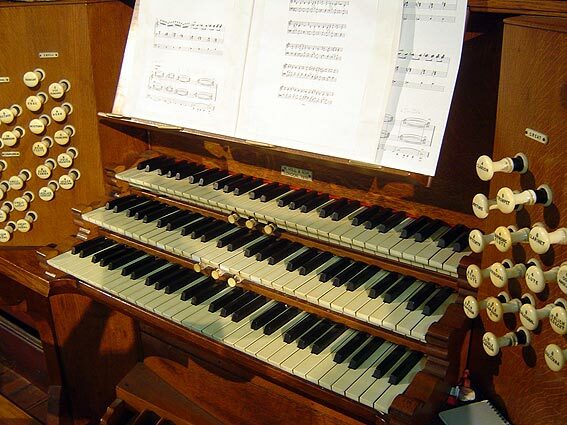 The instrument today is remarkably intact, with the original mechanisms preserved in their entirety and the open metal chorus work retaining cone tuning throughout. Philip Cox and Clive Lucas, Australian Colonial Architecture (East Melbourne: Lansdowne Editions, 1978), 208, 210, and Morton Herman, The Early Australian Architects and their Work. (Sydney: Angus and Robertson, 1954), 216-217. 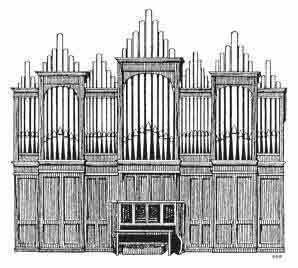 Graeme D. Rushworth, Historic Organs of New South Wales (Sydney: Hale & Iremonger, 1988), 72-3. Ibid., 144-45. 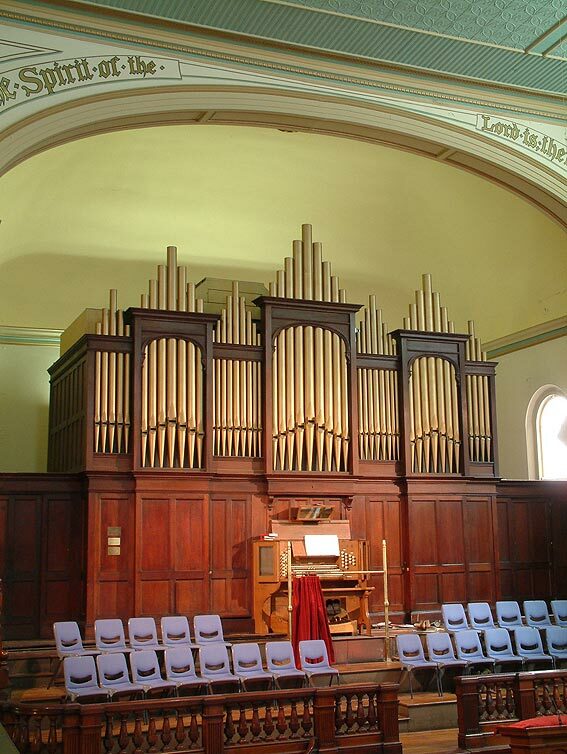 The Rendall was sold to Charles Richardson who rebuilt it with tubular-pneumatic action, reduced its size and installed it in Mary Immaculate Catholic Church, Waverley in 1909. 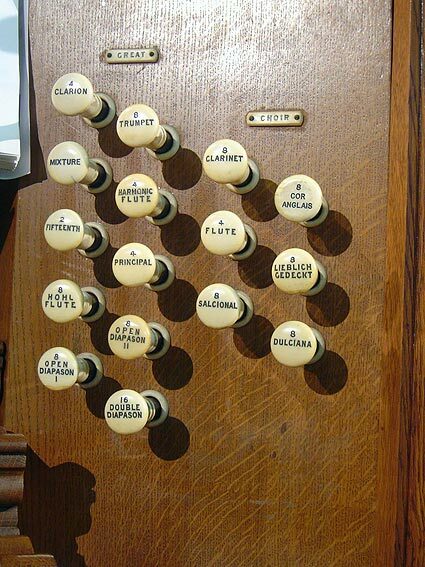 It was displaced by a Fincham organ in 1979.